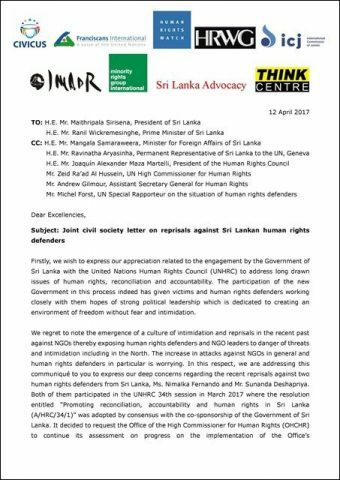 In response to the recent reprisals against two Sri Lankan human rights defenders, Ms. Nimalka Fernando (IMADR Co-Chairperson) and Mr. Sunanda Deshapriya, who participated in the 34th session of the UN Human Rights Council in March, 9 human rights organisations submitted a joint letter to the Government of Sri Lanka. Read the letter below or download here . We regret to note the emergence of a culture of intimidation and reprisals in the recent past against NGOs thereby exposing human rights defenders and NGO leaders to danger of threats and intimidation including in the North. The increase in attacks against NGOs in general and human rights defenders in particular is worrying. In this respect, we are addressing this communiqué to you to express our deep concerns regarding the recent reprisals against two human rights defenders from Sri Lanka, Ms. Nimalka Fernando and Mr. Sunanda Deshapriya. Both of them participated in the UNHRC 34th session in March 2017 where the resolution entitled “Promoting reconciliation, accountability and human rights in Sri Lanka (A/HRC/34/1)” was adopted by consensus with the co-sponsorship of the Government of Sri Lanka. It decided to request the Office of the High Commissioner for Human Rights (OHCHR) to continue its assessment on progress on the implementation of the Office’s recommendations and other relevant processes related to truth, justice, accountability, reconciliation and human rights in Sri Lanka for next two years. On 27th March, a protest was organised by the Women for Justice (WFJ) Organization on the street of Ms. Fernando’s residence. The demonstrators condemned her that she is lying to the United Nations and working for foreign money. Those personal attacks by alleged non-State actors raise serious concerns on the safety of the human rights defenders who rightfully engaged with the UNHRC. Since 30th March, a number of Sri Lankan human rights defenders including Ms. Fernando and Mr. Deshapriya have been named by certain individuals in Sri Lankan media. They are labelled as “foreign-funded NGOs working against the country”. The reprisals against the two human rights defenders were reactions to the new UNHRC resolution on Sri Lanka. The perpetrators claimed that the two are responsible for the Council’s decision to extend the OHCHR’s monitoring on the country. Yet in fact, the UN High Commissioner for Human Rights Zeid Ra’ad Al Hussein clearly recommended the UNHRC “to continue its close engagement with the Government of Sri Lanka and to monitor developments in the country”, based on his office’s independent and comprehensive assessment of the country’s progress on the transitional justice process. At the same time, he drew attention to the continuing incidents of harassment of human rights defenders, the use of hate speech and aggressive hate campaigns against groups and individuals in Sri Lanka. The recent two attacks are clear examples of reprisals against human rights defenders who cooperate with the UN human rights system. In 2015, the Government of Sri Lanka demonstrated its commitment by co-sponsoring the UNHRC resolution 30/1 to address all attacks against human rights defenders, hold perpetrators accountable and prevent future attacks. However, we regret that the Government failed to investigate the previous incidents against human rights defenders including Ms. Fernando’s case in 2013. It left the culture of impunity unaddressed which facilitated the recent attacks against Ms. Fernando and Mr. Deshapriya.